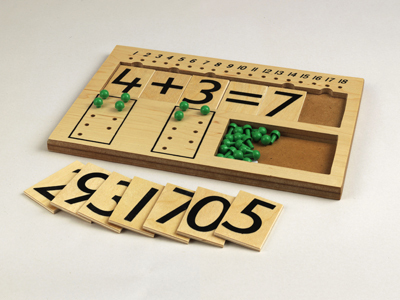 The Adding Board is a unique Lisheen Toys product, designed by us to aid children in learning basic arithmetic. The board itself is a sturdy frame with an indentation along the top, within which numbered boards fit. 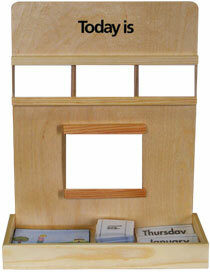 There are also holes to hold the included pegs, and a storage slot for pegs not being used. The child is given a problem to solve, e.g. "What is three plus four?". The child locates the "3", "+" and "4" boards, and places them in the indentation along the top of the board. In the holes underneath the "3", the child places three pegs, and in the holes underneath the "4", the child places four pegs. The child then removes the pegs one by one and places them in the individual numbered holes along the top of the board. When all the pegs from beneath the "3" and the "4" have been moved to this number line, the child can see that they fill the holes up to the number seven. The child then locates the number "7" board, and places it in the indentation, forming the completed sum " 3 + 4 = 7". This exercise helps the child's recognition of the numbers 1 to 18, and more importantly, helps the child identify these numbers with the correct number of pegs.